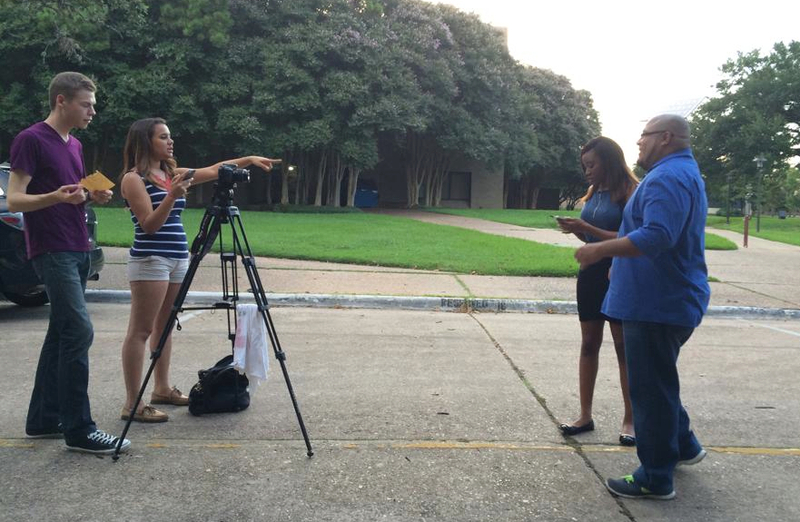 Latino students create their own opportunities in journalism school. Journalism schools across the country are failing Latinos – and creating a talent deficit for media companies in the U.S. The chaos of the Internet has wrecked on the industry and has left journalism schools scurrying to plug the digital holes in their curriculum, while universities ignore the Latino demographic tsunami that is moments away from engulfing and sinking their proverbial ship. According to the Pew Research Center, 800,000 U.S.-born Latinos enter adulthood each year, which is expected to rise to over a million annually. By 2060, they will account for 31 percent of the U.S. population. The implications of the population shift are stark for higher education and the media. These staggering facts are not lost on NBC, Fox and other companies that are retooling their audience targeting strategies to capture the attention of Latinos, but for the most part, they are failing miserably. CNN Latino recently shut down because of its failure to “fulfill our business expectations.”. Isabel Bucarem, public relations director for CNN, stated that the company learned a lot from its foray into Latino programming and will use the opportunity to “innovate” and “evolve” their standing with the Hispanic community. It’s a conundrum that no media outlet has nailed down yet. The innovation problem for CNN and the rest of the industry is that journalism schools in America are not producing enough digitally savvy, culturally-connected journalists that can fill the talent gap media companies need to effectively reach the complex Latino audience. Journalism school is the students’ training ground for entry into TV/radio stations, newspapers, Internet publications and magazines. While academics recognize the impact of the Internet and have taken corrective action to modify their curriculums accordingly, journalism educators have yet to acknowledge the gaping holes that exist in regards to training the voice of the next multicultural generation. Research by Dr. Mu Lin, a digital journalism educator in New Jersey, has found that of 483 journalism and communications programs in the U.S., 111 are identified as digital or multimedia. This is a clear sign that j-schools are catching up with the digital age. No such research is readily available for schools that offer bilingual journalism majors. There are only a handful of universities that address student demand for such a specialty. Florida International University offers a master’s program with three Spanish-language specializations that focus on multimedia for a Latino audience. For undergraduates, California State University Northridge offers a minor in Spanish-language journalism. The vast majority of Latino students across the country lack such an opportunity to hone their bilingual journalism skills and utilize their cultural knowledge on campus. Latinos wouldn’t be in danger of languishing at career killing levels if the administration and faculty of journalism schools reflected the diversity of their campus. Latinos are woefully underrepresented as adjuncts, professors, advisors, lecturers and deans. This lack of diversity translates to a curriculum void of relevant courses that help students succeed in the competitive world of “ethnic” media. When Latino students bring up their apprehension about landing a job to the school’s academic advisors, the advisors are more often than not ill-equipped to counsel the student on the best course of action for securing employment in Latino-oriented media. Many j-schools have an established relationship or an internship program with their local newspaper. Very few make such an effort to reach out to Spanish-language publications. The failing of the Latino student journalist extends beyond the classroom and into the student newspapers that are often independent of the university from which they operate. Often times a young reporter’s first experience in a newsroom that does not run Spanish-language content even when their school is a Hispanic-serving institution. Latinos quickly find that school newspapers are unofficially English only. Student reporters who pitch Spanish-language stories to their editors are often rejected and told that their story is not “newsworthy” or that the paper doesn’t want to go in that direction. Without effective support from the university or a publication to practice their storytelling, Latino students are forced to develop their own hit-or-miss career development plans. These students routinely find themselves in informal internships at dubious media companies or rely on “mentors” whose best advice is to forget about the inverted pyramid and buy a low-cut blouse instead. When Latinos cannot utilize their cultural knowledge and expand their journalistic chops on campus it hurts the media companies whose bottom line increasingly relies on the Latino population and the advertisers they attract. For companies looking to unlock the puzzle of the Latino market, grooming the next generation of media innovators begins at freshman orientation. Raymond Ruiz, founder of El Gato Media Network, a 501c(3) nonprofit in Houston that develops college students into media professionals. Since 2008, Raymond has been working with media outlets to provide opportunities to journalism and digital media students.